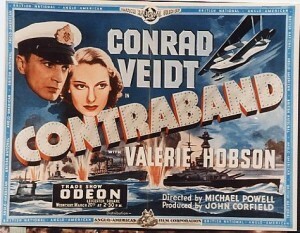 Set in early World War II, Contraband is about a Danish sea captain, delayed in a British port when a blackout occurs. The darkness brings chaos with smugglers and spies wanting to take advantage and the captain is forced to participate in a game of cat and mouse through the dark streets of London looking for important papers that belong to the ship. However, he discovers something a lot bigger than a few thieves trying to make a quick profit. Directed by Michael Powell (Black Narcissus, A Matter of Life and Death, The Life and Death of Colonel Blimp), the film stars Conrad Veidt (Nazi Agent, Casablanca, Above Suspicion), Valerie Hobson (The Voice of Merrill, Background, Knave of Hearts) and Hay Petrie (Noose, The Monkey’s Paw, The Queen of Spades). Ramsgate, particularly the harbour and railway station doubled as the fictional town Eastgate-on-Sea in the film. Situated in East Kent, Ramsgate is a beautiful coastal town, home to the Port of Ramsgate, the only Royal Harbour Marina in the country. The area also boasts a beach, amusements, arcades, shops, restaurants and a theatre. Ramsgate has been used as a film location for Eastenders (2015), Big Bad World (2013) and Johnny English Reborn (2011). Contraband is available to purchase on DVD. This entry was posted in Filmed in Kent and tagged Conrad Veidt, Contraband film locations, feature film, Hay Petrie, Michael Powell, Ramsgate, Valerie Hobson. Bookmark the permalink.